Barton, Thomas L., William G. Shenkir and Brian C. Marinas. 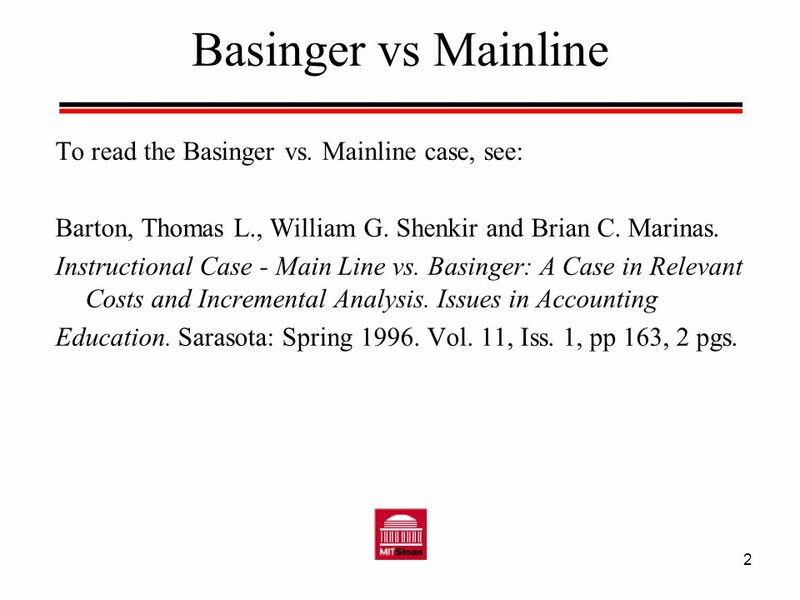 Instructional Case - Main Line vs. Basinger: A Case in Relevant Costs and Incremental Analysis. 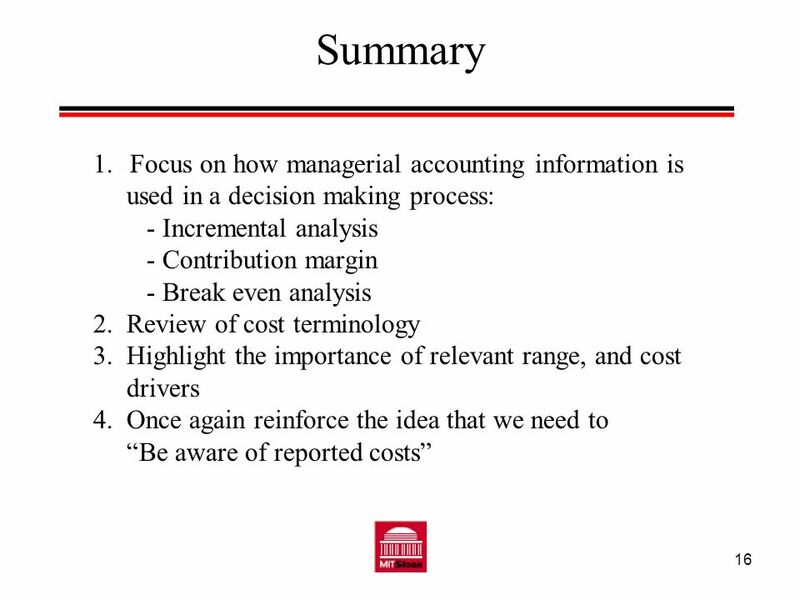 Issues in Accounting Education. Sarasota: Spring Vol. 11, Iss. 1, pp 163, 2 pgs. 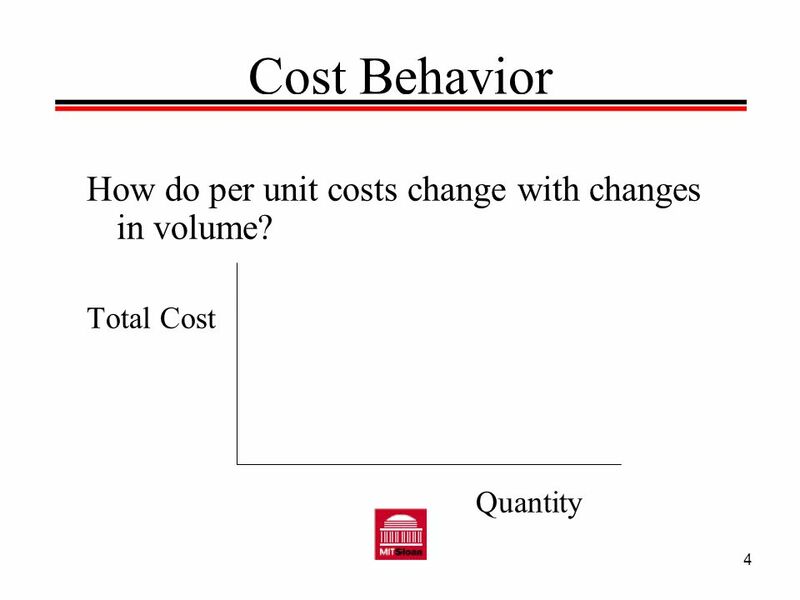 4 Cost Behavior How do per unit costs change with changes in volume? 7 Cost Drivers Most insect traps work because of Pheromones. Each insect has a different Pheromone, thus to make a particular type of insect trap, you need to mix different chemicals. We can break up the production process into the following activities. To make an insect trap you must: 1. Set up for mixing 2. Mix chemicals 3. Kiln chemicals 4. Make the traps. 8 Cost Drivers To set up to mix 16 ounces to 1600 ounces of a pheromonefor kilning takes 50 hours of $20 per hour. An individual Kiln can only handle up to 100 pounds of apheromone, then a new kiln has to be setup. Thus setup costs are fixed cost for up to 100 pounds of a pheromone. So how much would it cost (in terms of labor dollars) to make 250 lbs of fruit fly pheromone? 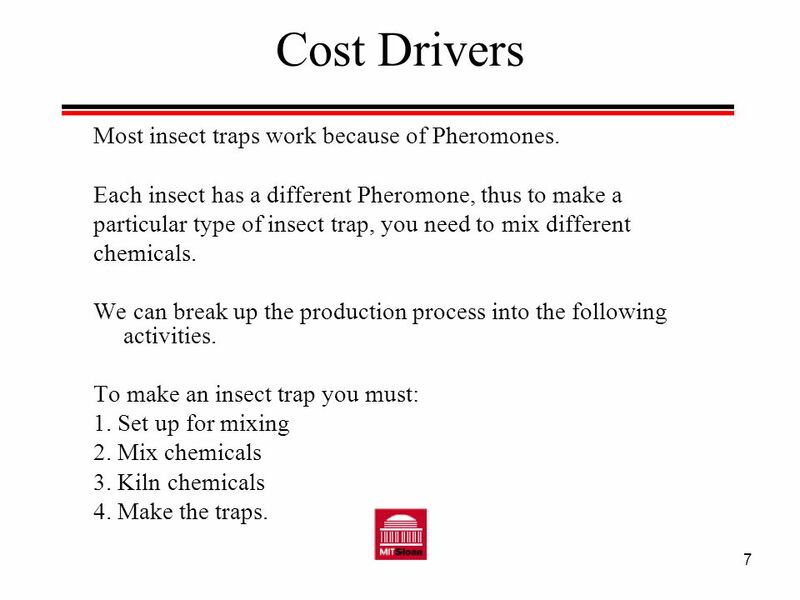 9 Cost Drivers What was your first inclination to do in calculating the cost of making the fruit fly pheromone? What happens in costing this product when we addlayers to the production process like assembly,disposal, shipping, receiving? 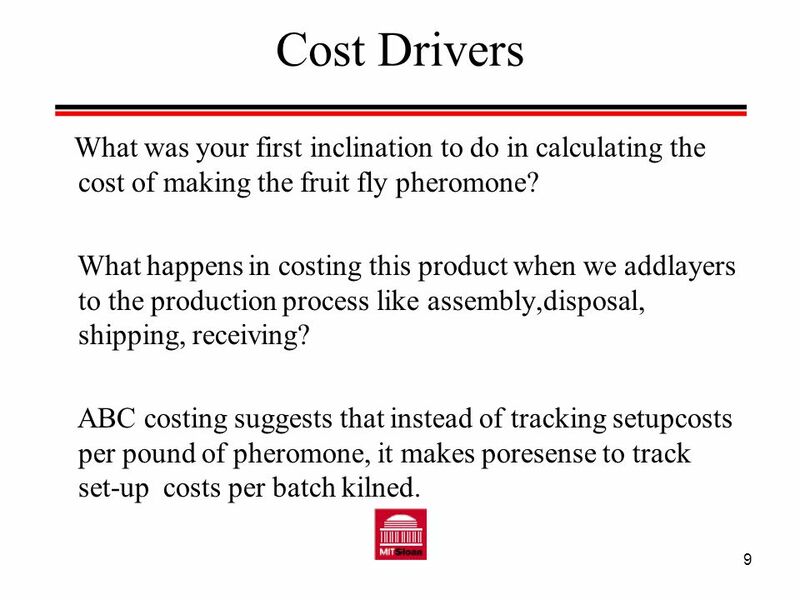 ABC costing suggests that instead of tracking setupcosts per pound of pheromone, it makes poresense to track set-up costs per batch kilned. 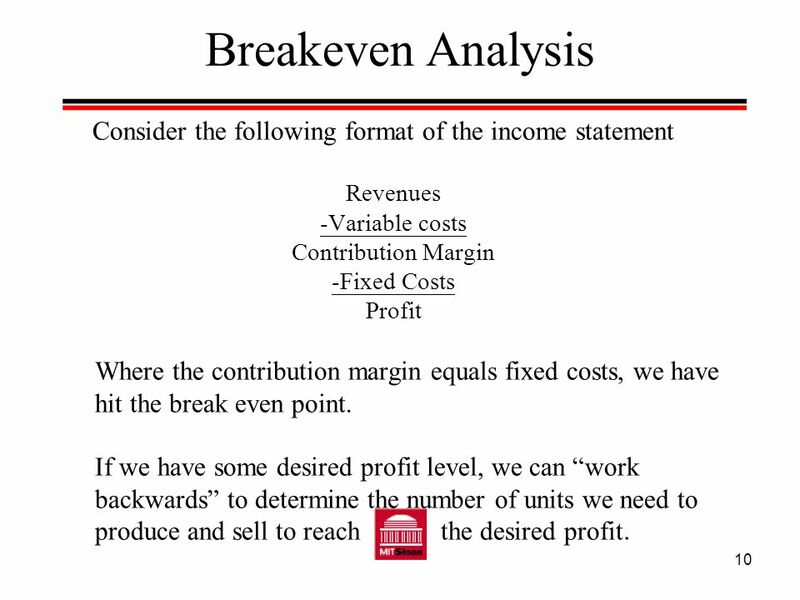 10 Breakeven Analysis Consider the following format of the income statement Revenues -Variable costs Contribution Margin -Fixed Costs Profit Where the contribution margin equals fixed costs, we have hit the break even point. If we have some desired profit level, we can “work backwards” to determine the number of units we need to produce and sell to reach the desired profit. 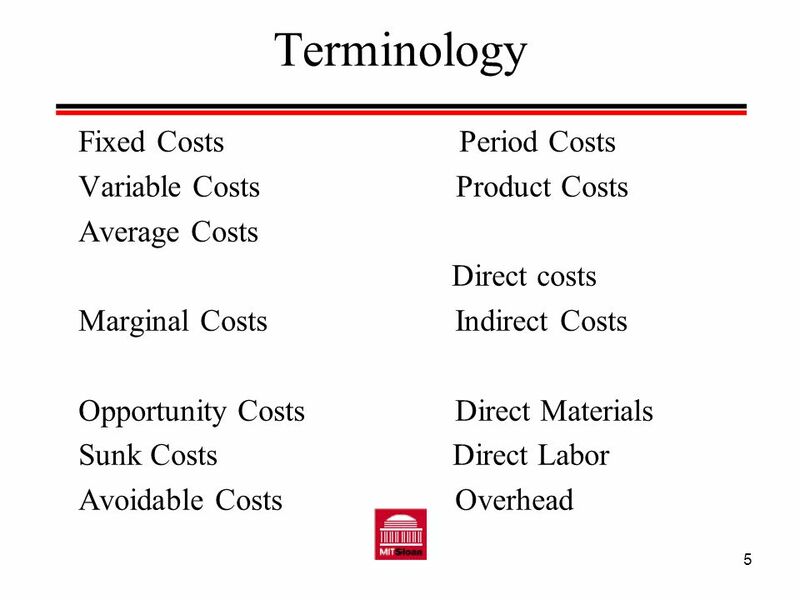 11 Operating Leverage Operating Leverage represents the ratio of fixed costs to total costs. Firms with higher operating leverage will experience relatively larger changes in income when there are changes in volume. 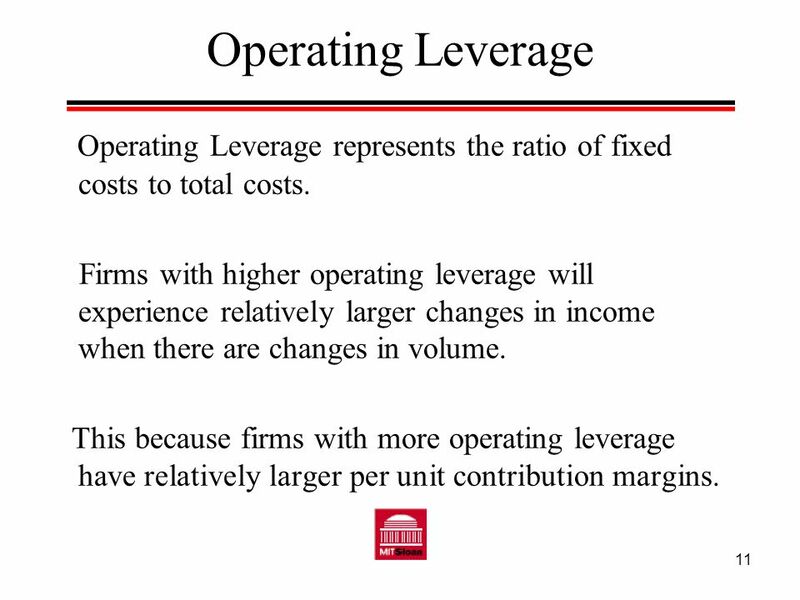 This because firms with more operating leverage have relatively larger per unit contribution margins. 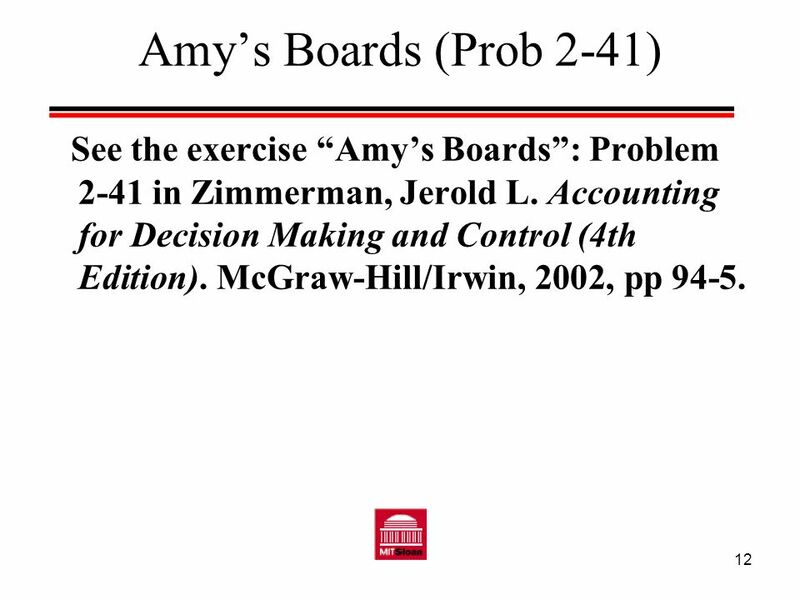 12 Amy’s Boards (Prob 2-41) See the exercise “Amy’s Boards”: Problem 2-41 in Zimmerman, Jerold L. Accounting for Decision Making and Control (4th Edition). McGraw-Hill/Irwin, 2002, pp 94-5. 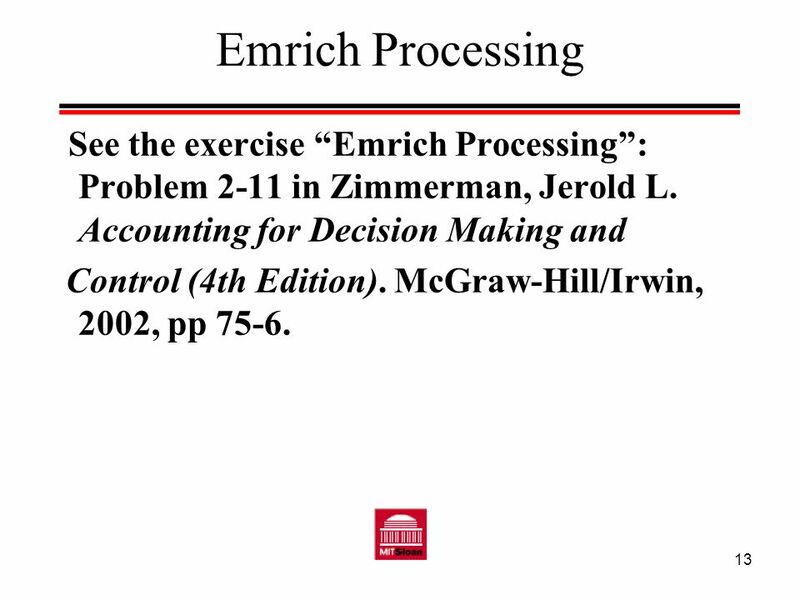 13 Emrich Processing See the exercise “Emrich Processing”: Problem 2-11 in Zimmerman, Jerold L. Accounting for Decision Making and Control (4th Edition). McGraw-Hill/Irwin, 2002, pp 75-6. 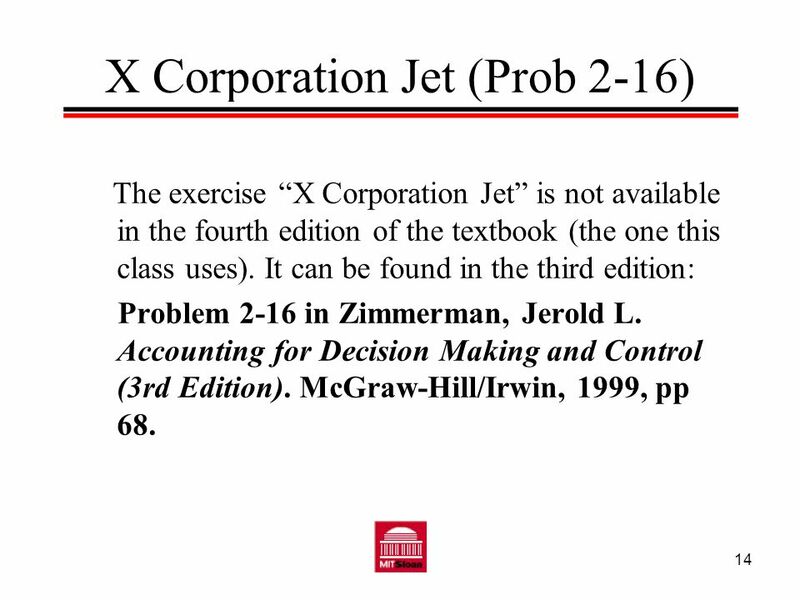 The exercise “X Corporation Jet” is not available in the fourth edition of the textbook (the one this class uses). It can be found in the third edition: Problem 2-16 in Zimmerman, Jerold L. Accounting for Decision Making and Control (3rd Edition). McGraw-Hill/Irwin, 1999, pp 68. 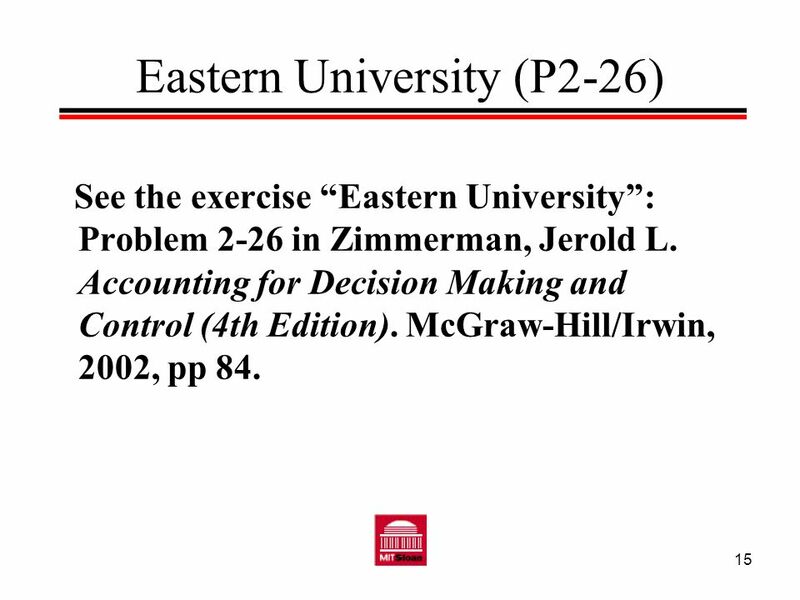 See the exercise “Eastern University”: Problem 2-26 in Zimmerman, Jerold L. Accounting for Decision Making and Control (4th Edition). McGraw-Hill/Irwin, 2002, pp 84. 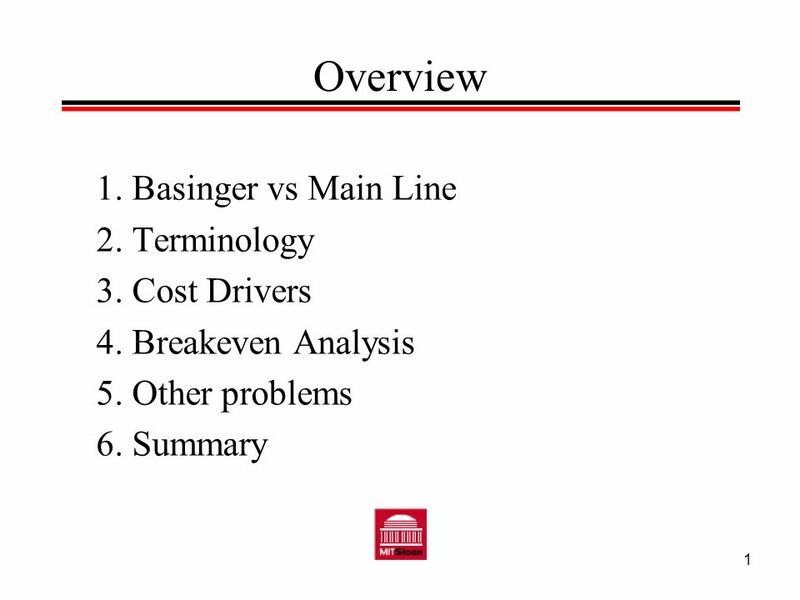 Download ppt "Overview 1. Basinger vs Main Line 2. Terminology 3. 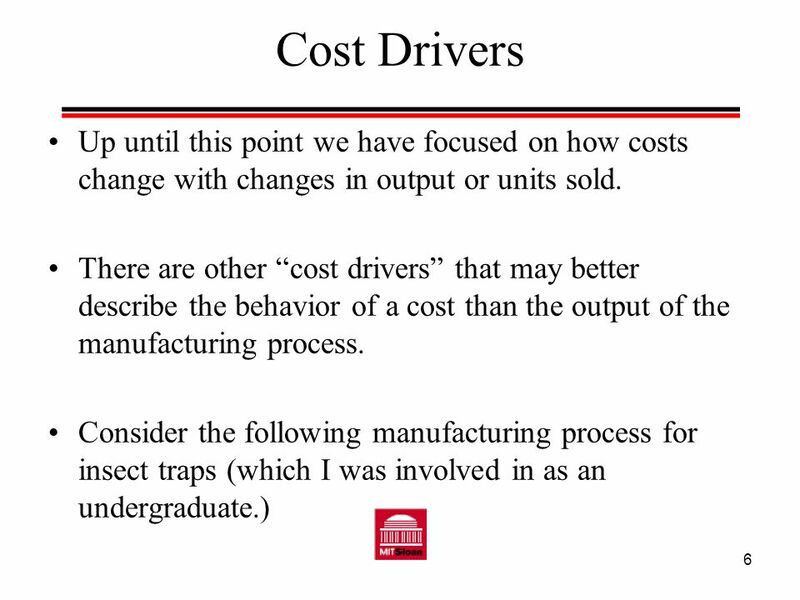 Cost Drivers"
McGraw-Hill/Irwin ©2008 The McGraw-Hill Companies, All Rights Reserved Chapter 8 Markups and Markdowns: Perishables and Breakeven Analysis. McGraw-Hill/Irwin Copyright © 2009 by The McGraw-Hill Companies, Inc. All rights reserved. Chapter 4 Short-term Decision Making. McGraw-Hill/Irwin Copyright © 2009 by The McGraw-Hill Companies, Inc. All rights reserved. McGraw-Hill/Irwin Copyright © 2007 by The McGraw-Hill Companies, Inc. All rights reserved. 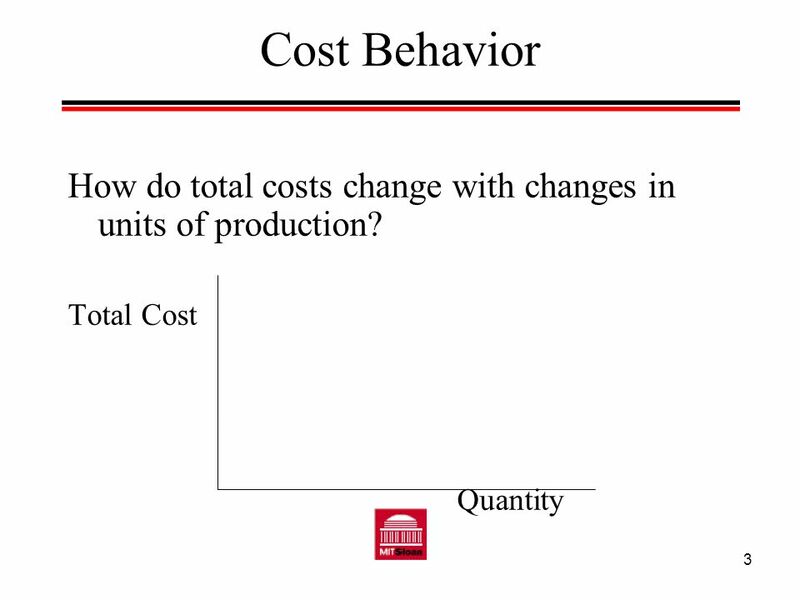 Chapter Eleven Cost Behavior, Operating Leverage, and CVP Analysis.